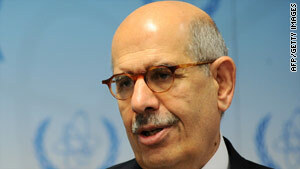 Mohamed ElBaradei has criticized Iran's over its failure to provide information about its nuclear program. (CNN) -- The board of the United Nations' nuclear watchdog agency Friday sharply criticized Iran's nuclear activities in a resolution, and urged Iran to immediately suspend construction of its recently disclosed nuclear facility at Qom. Twenty-five of the 35 member countries of the International Atomic Energy Agency board voted for the resolution, with Russia and China joining the United States, Britain, France, and Germany -- a reflection of the international community's concerns that Iran is intent on pursuing nuclear weaponry. Cuba, Malaysia and Venezuela cast the only three votes against the resolution. "The resolution passed today by the IAEA Board of Governors sends the strongest possible signal to Iran that its actions and intentions remain a matter of grave international concern," said British Foreign Secretary David Miliband. The White House said the "overwhelming vote" underscores "the resolve and unity of the international community with regard to Iran's nuclear program" and senior administration officials said the United States had warned Iran Friday that it is prepared to push for significantly stronger economic sanctions in wake of the resolution. Iran has long denied claims that it wants to build nuclear weapons. Foreign Ministry spokesman Ramin Mehmanparast slammed the resolution, saying calling it a "formal, showy and purposeful gesture, aimed at exerting pressure on the Islamic Republic. Such behaviors are vain." The resolution notes "with serious concern" that "Iran continues to defy the requirements and obligations" in IAEA and U.N. Security Council resolutions and that Iran built an "enrichment facility at Qom in breach of its obligations to suspend all enrichment related activities." It said Iran's "failure to inform the agency" that it was building a new facility "does not contribute to the building of confidence." "Iran's declaration of the new facility reduces the level of confidence in the absence of other nuclear facilities and gives rise to questions about whether there are any other nuclear facilities under construction in Iran which have not been declared to the Agency," the resolution said. The board emphasized that unless Iran cooperates with the IAEA and abides by Security Council resolutions, the agency "will not be in a position to provide credible assurance about the absence of undeclared nuclear material and activities in Iran." Also the resolution notes that Iran needs to supply more information and more cooperation so the IAEA can "exclude the possibility of military dimensions to Iran's nuclear programme." The resolution calls for Iran "to engage with the Agency on the resolution of all outstanding issues concerning Iran's nuclear programme and, to this end, to cooperate fully with the IAEA by providing such access and information that the Agency requests to resolve these issues." That includes "requested clarifications" about the purpose of the Qom enrichment plant and "the chronology of its design and construction." It also urges Iran to confirm that it "has not taken a decision to construct, or authorize construction" of other nuclear facilities not disclosed to the IAEA. The votes for the resolution included Germany and the five permanent members of the U.N. Security Council, countries that have engaged in diplomacy over Iran's nuclear program. That's significant because the votes included those from Russia and China -- which have not always sided with the efforts by the United States, Britain, and France. There were also six abstentions and one absence. In his statement, Miliband noted that the resolution clearly states that unless Iran complies with its obligations to the IAEA and the U.N. Security Council, "it remains impossible for the international community to have any confidence in Iranian intentions." Miliband said Britain and other nations "have made it very clear that our hand is stretched out to Iran. We are waiting for Iran to respond meaningfully. But if it is clear that Iran has chosen not to do so, we will have no alternative but to consider further pressure on Iran ... "
As for the United States, senior administration officials authorized to speak with reporters on the condition their names not be used said, "We are committed to putting together a package of consequences if we don't find a willing partner. We hope Iran takes note of that clear message." The White House said the resolution also "underscores a commitment to strengthen the rules of the international system, and to support the ability of the IAEA and U.N. Security Council to enforce the rules of the road, and to hold Iran accountable to those rules." "Indeed, the fact that 25 countries from all parts of the world cast their votes in favor shows the urgent need for Iran to address the growing international deficit of confidence in its intentions," it said. The resolution was adopted during the IAEA board of governors meeting and coincides with the stepping down of Agency chief Mohamed ElBaradei -- who issued sharp words about Iran in his final report to the agency in Vienna, Austria. It commends ElBaradei "for his professional and impartial efforts" in working "to resolve safeguards issues in Iran." And, it commends him for pursuing an agreement with the IAEA, France and Russia for assistance in pursuing nuclear fuel for Tehran's research reactor. Earlier this month, Iran retreated from the research reactor deal -- designed to allay fears that the Islamic republic is developing nuclear weapons. That deal would have required Iran to send its partly enriched uranium abroad to be turned into material for civilian uses such as electricity and medical research. ElBaradei said the IAEA has hit "a dead end" in verifying information about Iran's nuclear program and that "there has been no movement on remaining issues of concern which need to be clarified for the agency to verify the exclusively peaceful nature of Iran's nuclear program." In September, Iran shocked the world with the revelation of a nuclear facility at Qom that it had been building secretly. Since then, it has allowed IAEA inspectors to visit the plant. "Iran's late declaration of the new facility reduces confidence in the absence of other nuclear facilities under construction in Iran which have not been declared to the agency," ElBaradei said Thursday in Vienna, opening a meeting of the IAEA's 35-member board of governors. U.S. President Barack Obama has warned Iran that there will be "consequences" if it does not accept the plan.